HAMPTON HILLS HAS BEEN A CENTURY IN THE MAKING. On Sept. 14, 1924, an advertisement appeared in The Dallas Morning News announcing the development of Hampton Hills. The new neighborhood would be accessible to the city of Dallas via the Oak Cliff street car line, and would have every “modern improvement,” including “permanently paved streets, sewerage, water, gas, lights, etc.” By November, an ad campaign was launched, aimed at the tradesmen and middle managers of local companies who were interested in moving to the area for its convenience and proximity to their employers. Billed as “Oak Cliff’s Ideal Home Place,” Hampton Hills boasted terraced lots, extra wide parkways and well-drained high ground. 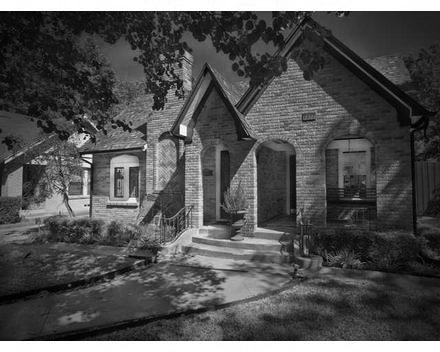 The neighborhood’s developer, Alf W. Sanders, built his own home at 1322 Montreal Ave., and set up a sales office for his Hampton Hills Realty Company in a small Tudor-style building on Tilton (now Wilton) Street. It still stands today. A Dallas Morning News item on Nov. 16 announced “a completely developed subdivision” on the new Hampton Place streetcar line. Hampton Hills Realty Company ads emphasized the neighborhood’s convenience, commanding view and unmatched value. The ad blitz culminated with the “tag sale” ad on Thanksgiving Day, which drew attention to the neighborhood’s proximity to streetcars and schools. A.W. Sanders went on to build many of the neighborhood homes in the craftsman and Tudor styles, with small garages standing behind them. The picturesque wood-sided and brick and stone cottages had a charming, storybook quality about them. Even today, fine examples of stained glass can be seen in many windows, as well as unique brick and stone work. Many interiors boast archways, hardwood flooring, cheerful bathrooms and galley kitchens with quaint breakfast rooms and built-in cabinetry sparkling with beveled mirrors and stained glass. Some fireplace mantels display multiple types of wood and are flanked by built-in bookcases, which were favorite gestures of the builder. Homebuilding was curtailed during World War II (because of strict rationing of materials for the war effort), creating a housing shortage for returning soldiers and their families. To help address the crisis, Oak Cliff realtor and builder Wiley Roberts, who also served as executive board chairman of the Dallas Association of Home Builders, announced his intention to finish out the Hampton Hills neighborhood. On Oct. 5, 1945, Roberts said he would build 25 new brick homes in Hampton Hills, averaging around $8,000 each. On Aug. 11, 1946, The Dallas Morning News reported that Roberts’ son Bill, a Navy veteran, would join his father in completing 40 new homes in the neighborhood. During the previous decade, home styles had evolved to include minimal traditional, which incorporated Colonial and Tudor forms with a modern preference for as little ornamentation as possible. Consequently, Wiley Roberts and Sons built finely crafted cottages with shallow- to medium-pitched gabled or hipped roofs (usually with no eaves), small covered porches with simple pillars or columns, simple floor plans and occasionally corner-wrapped windows. These post-war homes are mostly asymmetrical with the front entrance off center, and with either attached or detached garages. And because they were the last homes to be built in Hampton Hills, they tend to occupy the corner lots. To explore the neighborhood’s demographics, check detailed information compiled by City Data.